NETWORK is an adaptive model of a cycling infrastructure, that was tested in Moskovskiy district in Saint-Petersburg, Russia. The model suggests phased development and routes adaptation based on big data. 8. Optimization of the model. Increase the level of residents mobility, reduce the amount of cars, traffic jams, noise and air pollution. After the research of street network, traffic intensity, sociologists’ reports and suggestions of active social groups special algorithms were developed to calculate and optimize the routes between the main district attraction centers, connecting them in one network which is to become the first stage of the development. To form the optimal network 5 routes were developed, connecting different functional zones: main and secondary transport hubs, recreational areas, business clusters and malls. According to the functional program of the route, it was designed along primary or secondary roads. The main characteristics of the routes: minimal length, security, attractiveness. After the routes were developed they were optimized and connected in one network with total length of 150 km. All the routes are equipped with adaptive modular pavilions for bike storage. The adaptive model of cycling infrastructure is based on the city data analysis, transforms in time and space, and can be applied in different cities at different scales. 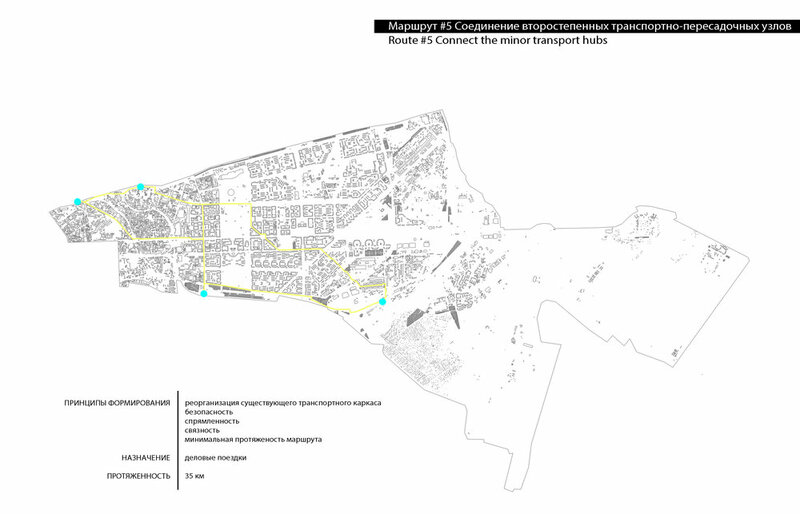 The NETWORK concept was developed during the “Atlas of ideas of Moskovskiy district” project.